Interview with Lejin Electronics: In 2010, the global sales target of 10 LED-backlit TVs was 7.5 million units. The competition in the LED-backlit TV market is becoming more and more fierce. The Korean TV manufacturer LG has also launched two LED backlight products with different functions, such as direct and side-by-side, to actively compete, and the stock market is in short supply. Recently, LEDinside specially interviewed Mr. Chen Qingquan, Manager of Marketing Group Management of Lejin Electrical Appliances in Taiwan, to discuss the characteristics of LG's LED-backlit LCD TV products and future market development trends. In July 2009, LG released the first LED-backlit LCD TV LH90 series, with a direct-lit LED backlight, equipped with 240Hz quadruple motion picture smooth technology and FULL HD 1080p high resolution, top specifications focus on image quality performance. In addition, LED backlight technology can provide ultra-high contrast of 5,000,000:1, while the direct local dimming technology makes the TV more energy-efficient, contrasting, and good color rendering. In terms of overall picture quality and brightness, the performance is optimized, and the power usage is reduced by 75%. On the other hand, the SL90 borderless LED LCD TV series launched last month, the light source adopts the side-entry LED backlight, the thickness is only 2.9cm, the exclusive ICM (Injection-Compression Molding) technology, high light transmission and good heat dissipation. To make the surface smoother; as for the Laminate Film, the compatibility with the liquid crystal panel is higher in color fine-tuning or level, and it can avoid external interference such as scratch, reflection or static electricity. The main technology of single-layer monochrome makes the glass mirror screen and the body completely integrated, completely subverting the traditional TV design concept. Straight down and side entry technology each have a long spread of about 5%. The two products are compared with the LED light source type of the TV. The direct type can be combined with the local dimming technology to achieve high contrast effect. The overall picture quality is excellent, but the thicker and more LEDs will lead to higher cost; Although the side-in type can save the use of LEDs to reduce the cost, the shape is thin and fashionable, but in the large-size application, the problem of uneven brightness of the screen may occur. Both technologies are good at each other, and they also have different consumer groups. It is difficult to distinguish between winners and losers in the short term. Manager Chen said that according to the current cost price of the whole machine, the 42" product CCFL and LED price difference is 40%, the 55" spread is reduced to 20%, the larger the size, the smaller the gap; and the direct and side-entry price difference is controlled. About 5%, taking 42" as an example, about NT$2,000. Compared to Sony's direct-lit, Samsung's white-light side-in, LG's biggest advantage in the LED-backlit TV market is to offer consumers two choices: direct and side-in; in terms of market response, despite the side-in SL90 The direct-lit LH90 is listed three months later, but the sales ratio in Taiwan is expected to reach 1:1 before the end of the year, while the global market is higher in side sales, indicating that consumers prefer the thin and light body. Looking forward to the future, LG Le will watch the development of LED-backlit LCD TV market; in product development, thin and light will no longer be the main appeal of side-entry technology, but will return to the basic needs of consumers (first function, followed by quality); As far as cost control is concerned, the extra functions will be removed, so that the price will be closer to the average consumer to increase sales, and it will be beneficial to speed up the size of the downward push, down to 32", and the maximum will be extended to 60". Manager Chen said that next year, the LED backlight TV direct product line will be expanded to two production lines, while the side entry will be 2-3, and the total of the two will be launched at least 10 new products, from 32" to 60", full size It is often worth mentioning that LG is quite confident in the future evolution of direct technology. LED light mixing technology and LED expansion can reduce the number of LEDs used, which not only reduces costs, but also reduces thickness. In 2009, LG sold 17 million units of TV in the world, including 400,000 LED-backlit TVs. In 2010, LCD TV shipments were targeted at 25 million units, and LEDs will account for 30% of the total sales. The trend of substantial growth; next year's Taiwan's performance target is 15% 150,000 units (currently Taiwan's annual TV sales are about 1 million units). Finally, in the penetration rate, about 1% in terms of Taiwan in 2009, it is expected to grow to 5-10% in 2010. In addition to LED-backlit TVs, LG also introduced LED-backlit LCD monitors, and Mr. Chen Junhong, the head of marketing management, Mr. Chen Junhong specifically shared with us its product features and views on the display market. At this stage, the small-size TV and display boundaries are blurred. As far as LG is concerned, it is divided by functional characteristics. The display has no built-in speakers and channel selectors. At present, LG has launched a 24" LED-backlit display with a high contrast of 2,000,000:1 (conventional 50,000:1) and a thickness reduction of 2cm, which is excellent in appearance and image quality. Director Chen Junhong said that the current LED and CCFL price difference, 18.5" at 1,000TWD, 24" spread is about 4,000TWD, unlike TV, the larger the size, the greater the price difference. Optimistic about the LED backlight in the display faster than the TV replacement rate, the first quarter of 2010 will start to launch new products of 18.5", 21.5", 23" and 24", Taiwan's penetration rate is estimated at 5% in the first quarter of next year According to the speed of new products, it is expected to climb 20% by the end of the year. Due to the demand for environmental protection and energy saving, LED backlights have been replaced by traditional CCFL backlights as the main source of medium and large-sized panel applications, especially after Samsungâ€™s ultra-thin TV design launched with side-in LED backlights has successfully entered the market. Brand manufacturers have also launched a series of LED-backlit TVs. LEDinside estimates that the penetration of LED-backlit TVs is expected to increase from around 3% this year to 13% next year; and the penetration rate of LED-backlit displays will increase from less than 1% this year to around 11% next year. Due to the thinness and cost considerations, the design of the side-in LED backlight has become a mainstream product; however, the direct type has the advantage of its image quality and is not easily replaced. At this stage, the side-in LED backlight is the first point on the threshold of entering the backlight, but in the future, the TV function that emphasizes high-quality rendering, the direct-lit LED backlight that can achieve local dimming should still be LED glare analysts said that LG adheres to the direction of research and development in a two-way manner. At the same time as the direct-lit LED backlighting, it also continues to develop side-entry LED backlight products, which enables the market products to be more diversified and to meet different requirements. Consumer demand. LED to shoot the light, English name is LED spotlights, it is the most popular energy conservation and environmental protection products, with more and more of lamps and lanterns made of LED as light source, one of the most acclaimed is LED to shoot the light, as compared with other LED lamps, LED lamp price is lower.LED lamp is mainly used for decoration, commercial space, lighting and Building Lighting, etc., with the development and progress of LED technology, the market of LED lamp performance advantage is very outstanding, high purity aluminum reflector, the beam is the most accurate and reflective effect is best;Symmetrical light distribution systems such as narrow Angle, wide Angle and asymmetric etc., and the projector lamp is equipped with a scale plate, people can adjust the radiation Angle conveniently according to the scale.In addition, in order to facilitate maintenance, the LED projector lamp is replaced by a back-up switch.The lighting decoration effect is first-rate, and the LED projection lamp can realize the dynamic effects of gradual change, jumping, color flashing, random flashing, gradual change, chase and scanning. 1. 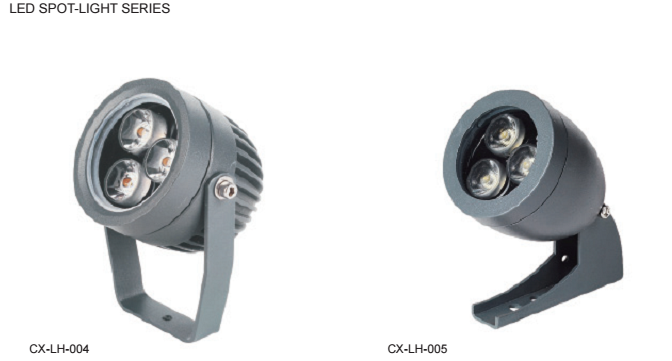 LED spotlights can be driven by low-voltage direct current: it has the advantages of small load and weak interference, and has low requirements on the use environment.2. LED spotlights can control the composition of the luminous spectrum well, so that they can be well used for local or key lighting in museums and exhibition halls. 3. The luminous directivity of LED spotlights is very strong: the luminance attenuation is much lower than that of traditional light sources, and the price of LED spotlights is fairly civilian. 4. The response time of LED spotlights is very fast: at the microsecond level, as long as the switch is on, it will be on immediately without any delay or flicker. 5. The light energy concentration of LED spotlights is very high: it is concentrated in a small wavelength window with high purity. 6. The service life is very long, generally between 50,000 and 100,000 hours, because LED is a semiconductor device, and even frequent switching will not affect the service life. 7. Good environmental protection, LED to shoot the light in the process of production don't add "mercury", also do not need air, do not need glass shell, good impact resistance, good shock resistance, invulnerability to breakage and facilitate transportation, very green, known as "green energy", the LED lamp price. 8. Energy saving, the spectrum of LED spotlights is almost all concentrated in the visible light frequency band, and its luminous efficiency can reach 80 ~ 90%.It is generally believed that the energy-saving of energy-saving lamps 4/5 is a great innovation, but LED spotlights are more than 1/2 energy efficient than energy-saving lamps, which is a greater reform of solid light sources.